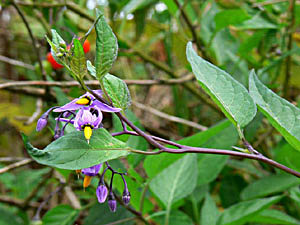 Bittersweet is a poisonous plant that has a long history of use in the treatment of skin diseases, warts, tumours, felons etc. 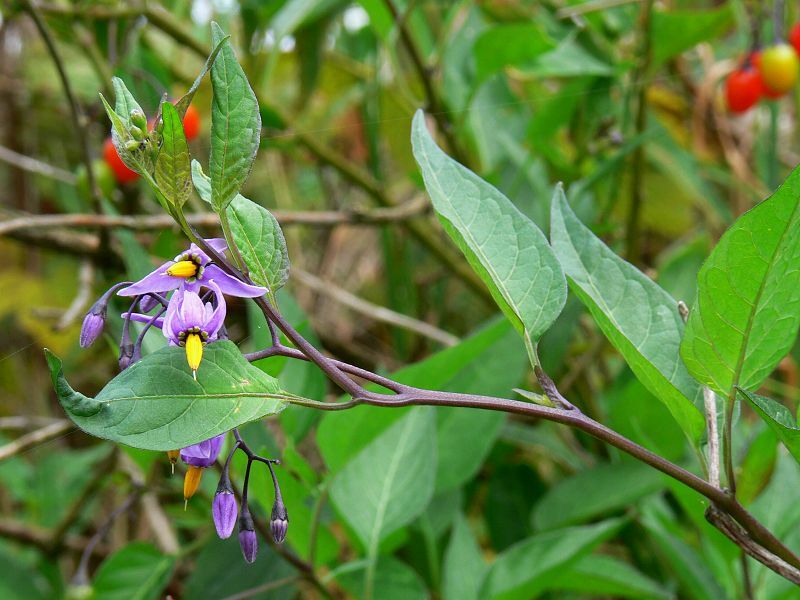 It should be used with caution and only under the supervision of a qualified practitioner, this is a poisonous plant that, in excess, paralyzes the central nervous system, slows the heart and respiration, and lowers temperature, causing vertigo, delirium, convulsions and death. See also the notes above on toxicity. All parts of the plant are alterative, anodyne, depurative, mildly diuretic, emetic, expectorant, hepatic, mildly narcotic and purgative. The dried stem, usually collected in the autumn and preferably from the ends of branches 2 - 3 years old, is the part that is most valued medicinally, though the leaves are also used. The plant is chiefly used as an alterative when taken internally in the treatment of a range of skin diseases, it is also used in the treatment of arthritis, rheumatism, bronchial congestion, heart ailments, ulcerative colitis and jaundice. Externally, the plant is used to treat skin eruptions, ulcers, rheumatism and cellulite. Two to three year old stems are harvested in the spring, or after the leaves have fallen in the autumn, and dried for later use. The fruits are marinated in vinegar and applied to cancerous sores and other swellings. A decoction of the root is used in the treatment of cancer and swellings. The root is harvested in the autumn and dried for later use. A homeopathic remedy is made from the fresh, green, still pliant stems and leaves, harvested as the plant begins to flower. This is used in treating a variety of complaints including backaches, cough, diarrhoea, eye inflammations and joint pains. Hedgerows and woody areas, avoiding acid soils. Also found on moist banks by the edges of swamps. Seed - sow spring in a cold frame. When they are large enough to handle, prick the seedlings out into individual pots and plant them out into their permanent positions in the summer. If you have sufficient seed then it can be sown outdoors in situ in the spring. Division in spring. All parts of the plant, including the fruit, are poisonous, though only mildly so.